We’ll be cutting down intruding sand pines to prevent the trees from taking away precious habitat for endangered Florida Scrub-Jays. 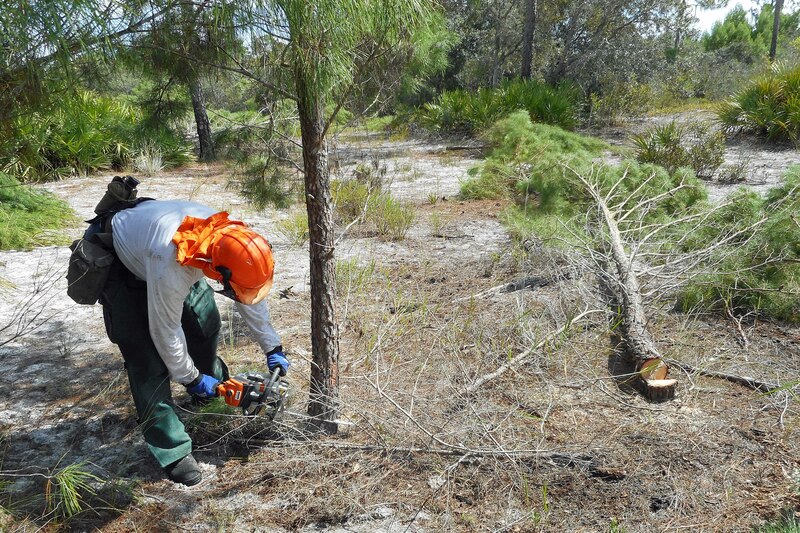 The objective is to reduce the density of sand pines and return the acreage to oak scrub. Scrub-jays won't use areas with sand pines as predators like Cooper's Hawks use them to hide in. Meet at the end of Algaringo Ave. The Silver Lake property is located between Sebring and Avon Park and is roughly in the area of the South Florida Community College, but about a mile west of US 27. We will be meeting at the end of an asphalt road, and then going in the south gate of the property using 4WD FWC Vehicles. Look for Ponce De Leon Blvd on the west side of US 27 and about a mile south of South Florida State College Entrance, and turn west onto Ponce De Leon. Take the first right onto Minorca Drive, and then the first right onto Algaringo Ave. Take Algaringo to the end. The FWC Silver Lake Scrub property is a part of the Lake Wales Ridge Wildlife and Environmental Area (LWR WEA), and has an active scrb jay population and is one of the Jaywatch survey locations. It’s also home to one of the few consistently active Kestrel nest boxes on the LWR WEA, which gives many Ridge Rangers a chance to see Kestrels and their nests, eggs, and fledglings during the annual spring surveys.